Phillip II of Macedon and his issue, 'Alexander the Shows Promise' (© Lloyd 2009) go on an aggressive recruiting drive in BCE 4th Century Greece. 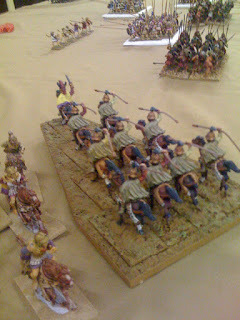 3000 point Warhammer Ancient Battles game, using the 'Rise of Macedon' list from the 'Alexander the Great' supplement for Phillip's Macedonians and the standard 'Armies of Antiquity' list for the Geeks. 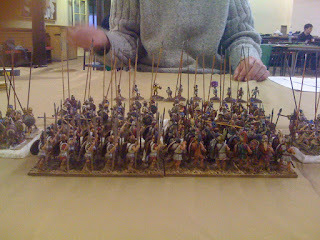 The Macedonians consisted of 4 battalions of pike plus one of hypaspists in the phalanx, a few peltasts and javelinmen out front, a sizeable contingent of Cretan archers, two troops of Companions, one of them the Agema, a troop of light horse and a troop of Thessalian Purple People Eaters. 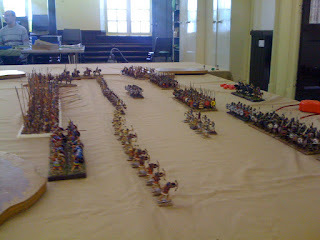 Alex was at the head of the Agema whilst Phil the not-quite-Greek (the Army General) was in the rightmost battalion of the phalanx. The Geeks had a phalanx of six battalions, two from Athens who held the left, two mercenary units who held the centre and two from Thebes, one of which was the Sacred Band, who were on the right. 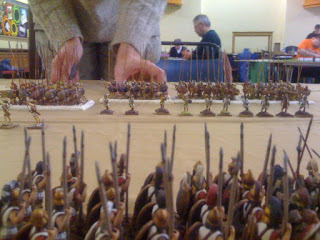 The remainder of the Geeks were peltasts, Cretan archers and the obligatory, solitary, useless unit of light cavalry. Each of the three hoplite contingents had its own general but in true democratic style, no-one could agree on an overall commander or, indeed - as it quickly transpired - a plan. As inveterate rule tweakers we couldn't play it straight but we didn't invent any rules, just attributed existing rules properly. Thus, all skirmishing troops get the 'feigned flight' rule, as did the hypaspists; the Athenians were rash, in that they could never refuse the opportunity to pursue a broken enemy. Both generals rolled slightly above-average for Oracles and both would like to put on record that this system makes a much better game than the '+1 in combat for having a standard' rule that it replaces. The game played out in predictable, but still very enjoyable style. 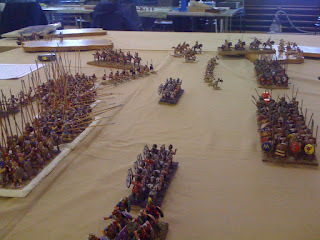 The Greeks got the better of the central skirmish fight at first but their lights could make no significant impact on the Macedonian phalanx with their missile fire. The Companions made some headway on the Macedonian left but got bogged a little in a fight with peltasts in broken, higher ground. On their right, however, the hypaspists , Cretans and Thessalians quickly saw off the Geek lights, exposing the Athenian hoplites rather uncomfortably. The hypaspists and Athenians engaged with the Athenians initially gaining the upper hand, but eventually succumbing to those dratted WS4 mountebanks. As Demosthenes' oratory wavered, the Thessalians piled in and the hoplites decided that a quick trip home and a life in the navy was what was called for. The centres clashed, meantime and then unfolded a typical Warhammer Ancients scenario: as the fight is resolved unit-by-unit, one side wins at one point and loses in another and the battle-lines fragment to an either a) exciting or b) ridiculous extent, depending upon your perspective. The Geek mercenary hoplites gave a reasonable account of themselves but were becoming ever more isolated, as the left-wing Athenians did one and the Thebans on the right, as we shall see, stood around stoically, waiting for the inevitable and trying hard not to spill any Macedonian blood. On the Theban wing, the Companions had stopped fiddling about with peltasts and started killing hoplites instead. 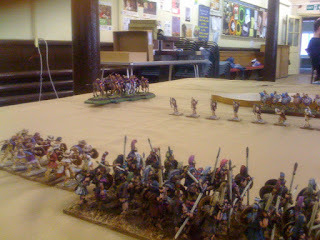 An especially devastating flank charge left the mercenary hoplites in the centre bereft of support. The Sacred Band, meanwhile, were far too occupied with, er, bonding to deign to come to anyone's aid. The Macedonian wings closed round the mercenary hoplites and surrounded them completely. At this point, the mercenaries unanimously agreed to swap doru for sarissa and take an extended holiday in Persia. Excellent report Steve. Thanks for posting it. Almost makes me sorry I moved away. Love big ancients battles.